It’s a tale as old as they come. A star in the sky leads 3 wise men to a quaint animal stable in Bethlehem. They bring gold, frankincense and myrrh with them. They give these items to a humble baby and his parents. We hear it every year when Christmas comes and although Jesus may be the focal point of the story, each character must play their role, like the Wiseman Gaspar. Gaspar was the Wiseman who brought with him frankincense (this costume has him depicted with some gold). Although he was never mentioned in the Bible by name, tradition believes that he became a martyr and a saint. He’s an important part of the story and you’ll definitely want him in your Christmas pageant this year! 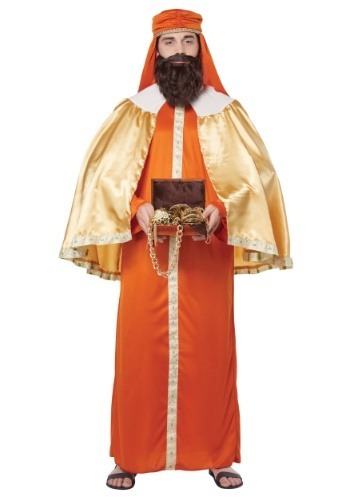 This adult Gaspar Wise Man costume will help you play the role of the famous character from the nativity story. The costume with a bright orange robe made of polyester. It also comes with a cape that ties around the beck and a bright orange turban. The turban has a foam lining to help keep its shape. When you have it all on, you’ll feel like one of the 3 wise men headed to see baby Jesus. Be sure to check out our Melchior and Balthasar costumes as well! You can assemble the 3 wise men and recreate the iconic story from the Bible at your next Christmas pageant.